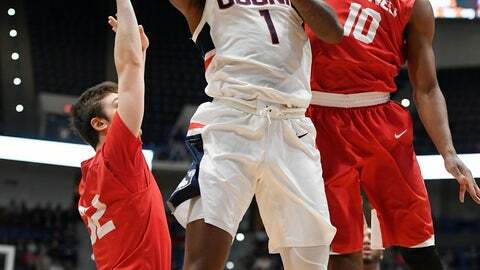 HARTFORD, Conn. (AP) — UConn showed off its depth in the backcourt on Tuesday night as it ran away from Cornell. Jalen Adams had 21 points to lead five UConn players in double figures and the Huskies bounced back from their first loss of the season with a 91-74 win over the Big Red. Christian Vital added 19 points for Connecticut (4-1), which had four guards score at least 10 points. Matt Morgan, who came in averaging 25 points, had 26 to lead Cornell (3-3). The Big Red had little trouble breaking UConn’s full-court man-to-man press early in the game and used back cuts to get some easy layups. They were outscoring the Huskies 12-6 in the paint midway through the first half and a layup by Morgan made it 23-20 Cornell. But UConn scored the next 13 points to take control. A steal by Vital led to a step-back jumper from Adams gave the Huskies a 13 point lead and UConn went into halftime up 48-33. A 3-pointer from Alterique Gilbert gave UConn its first 20-point lead at 55-33. Cornell was able to cut that to 13 points, thanks in large part to Morgan. But Tarin Smith scored 10 of his 12 points during a second-half run. The Huskies pushed the lead to 87-64 on an ally-oop dunk from Vital to Jalen Adams off a steal by Brendan Adams, which bought the crowd to its feet. “If we’re going to be successful and surprise people this year in terms of our success, the guards are going to have to, across the board, be consistently really, really good,” said UConn coach Dan Hurley. Cornell: The Big Red were outscored 44-30 in the paint, after outscoring UConn 18-16 down low in the first half. UConn: The Huskies had 38 turnovers in their two games last week in the 2K Empire Classic. They had 12 on Tuesday night, while scoring 25 points off 19 giveaways from Cornell. Cornell coach Brian Earl believes Morgan has the talent to play at the next level and then become a coach. The Big Red guard hit on 11 of his 15 shots, including 4 of 6 from behind the arc. Earl said his speed, efficiency and intelligence make him a special player. “He wants to be an NBA player,” he said. “Twenty years ago, when you got knocked around a lot, I don’t know if he could have done it. But now things are wide open and he’s got a lot of IQ for that, and desire to do it is half the battle. Vital had a breakaway dunk in the second half that bounced off the rim, went into the air then found its way back into the basket. That, and a few other questionable decisions, had his coach shaking his head on the sidelines. UConn: The Huskies, who were playing the first of five straight home games, ace another mid-major opponent, hosting New Hampshire Saturday in Hartford. Cornell: The Big Red have more than a week off before visiting Lafayette on Nov. 28.